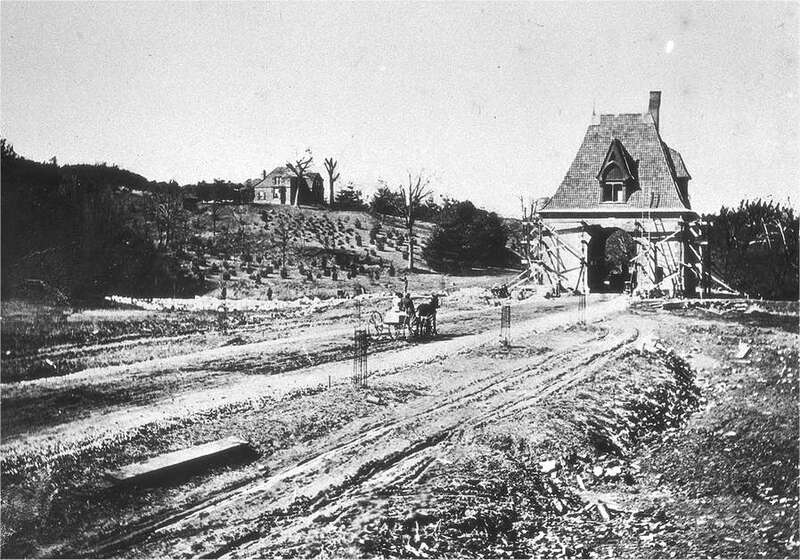 The gate lodge under construction in 1896. 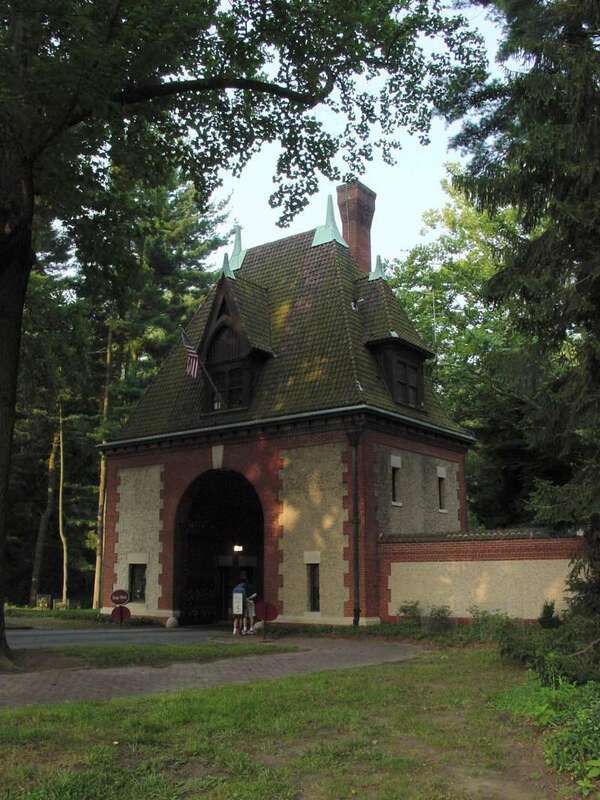 The gate lodge as it appears today. 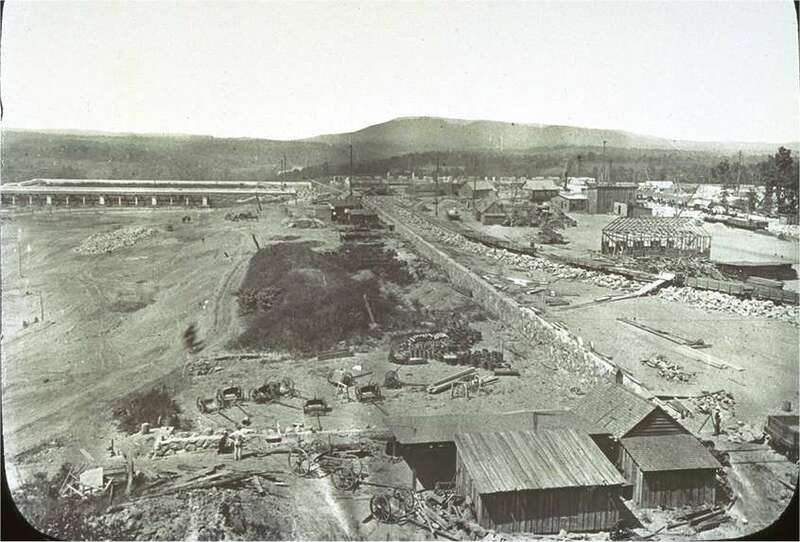 Here you see the ramble, esplanade, and site of the main house under construction in late 1891 or early 1892. Workers toil on the base of the huge retaining wall that will eventually hold the bowling green circa 1891. 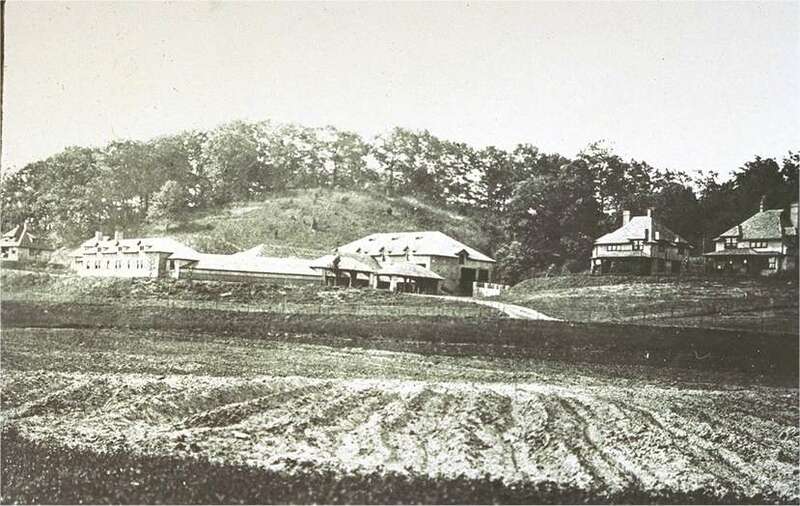 The house rises rapidly in the flurry of construction during 1894 and 1895. 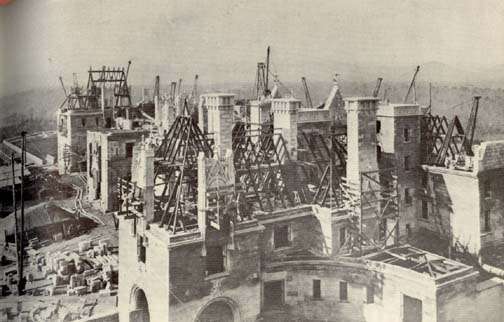 This photo shows the roofline starting to take shape March 10th 1894. After years of construction the carefully selected furniture is placed by George himself. This is the Louis 16th room, one of 32 guest bedrooms. Here is a 1940s photo of the tapestry gallery. Incomparable library. This room contains 10,000 volumes. Due to the walnut for the paneling arriving late and green the space was not finished until 1896. A view to the North taken around 1940. Another 1940s view this time showing the breakfast room. The leather walls and family portraits provide a fine setting for the circa 1860 dining table. The main banquet hall 72 feet long, 42 feet wide, and 70 feet high! In the late 1940s and early 1950s John Cecil lived above the billiard room. So this room was remade as a den for him to enjoy after tours ended. Here is a view of the billiard room in that role. One wonders where the custom made 2,500 pound tables went? The village had its own hospital named after George's cousin. Charles Barker who died at Biltmore in 1896. The western facade of the home with the lagoon in the foreground. 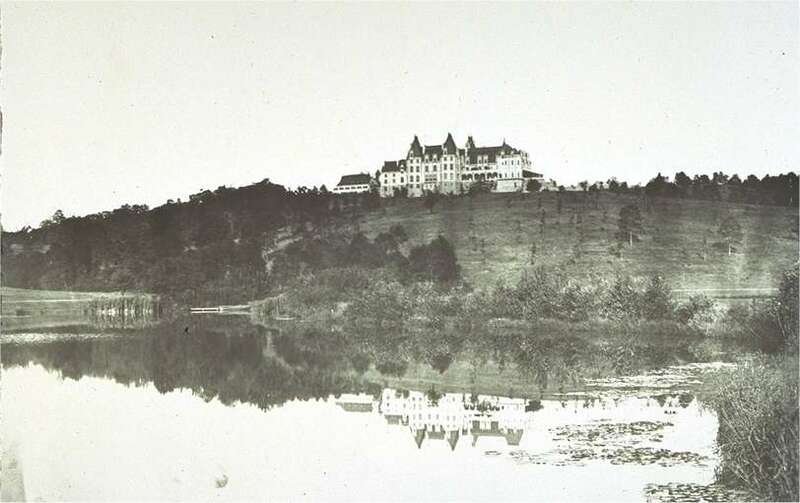 The lagoon was completed in 1898 at a cost of over $250,000. 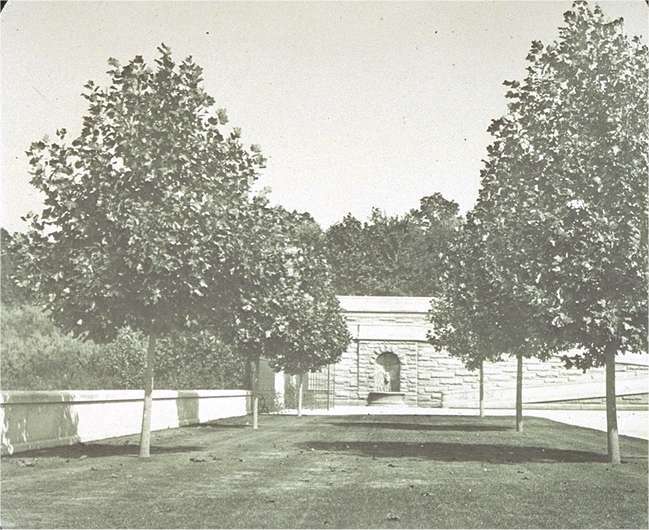 The gardeners cottage was the first building completed on site in the fall of 1892. 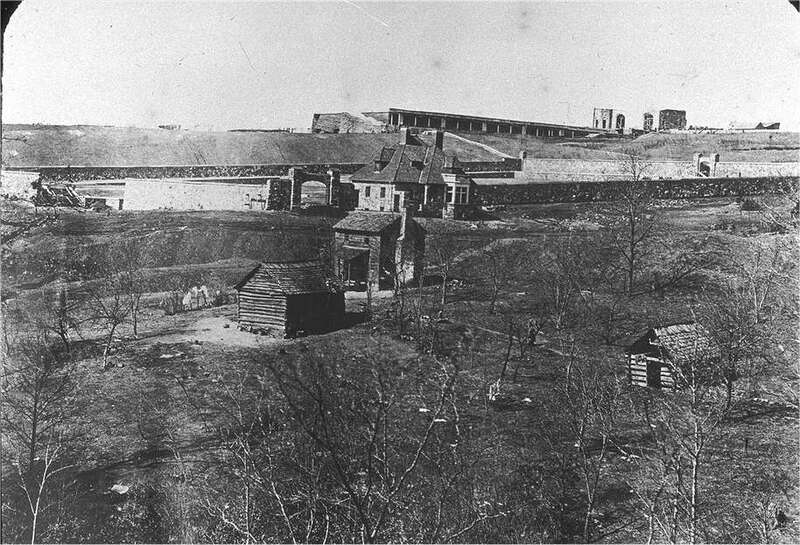 You can see the walls of the main house rising in what would become George's private den in the background. 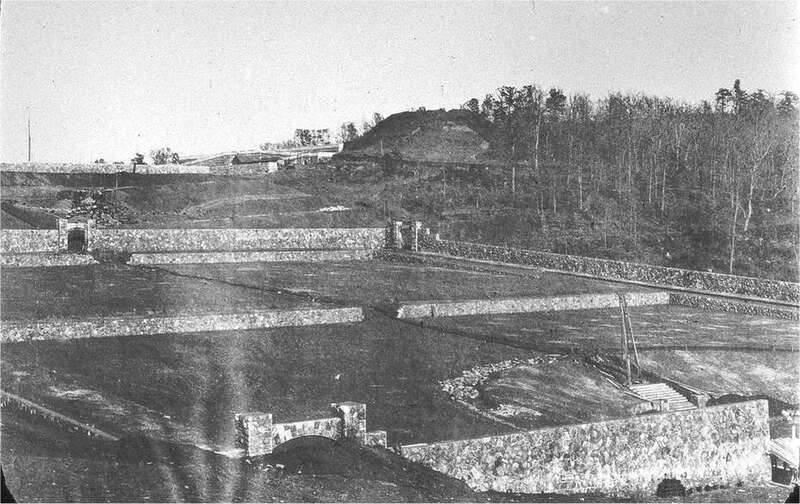 The walled garden under construction circa 1892. 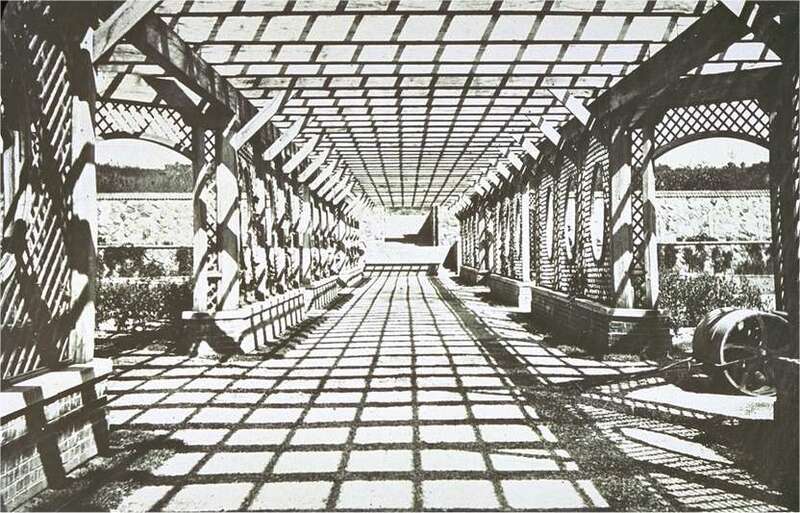 The arbor under construction. The pergola finished, with George's saint braynard Cedric in the foreground on the right. A view of the home looking towards the entrance tower. 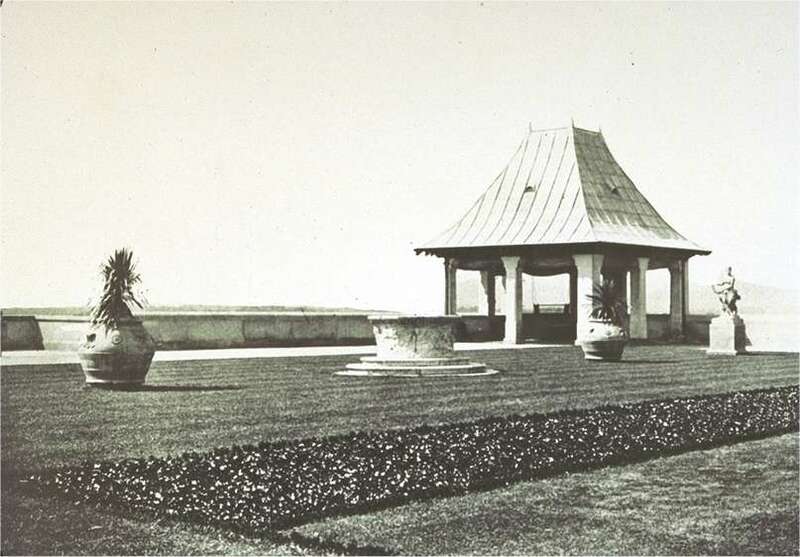 A photograph of the entrance tower circa 1900. 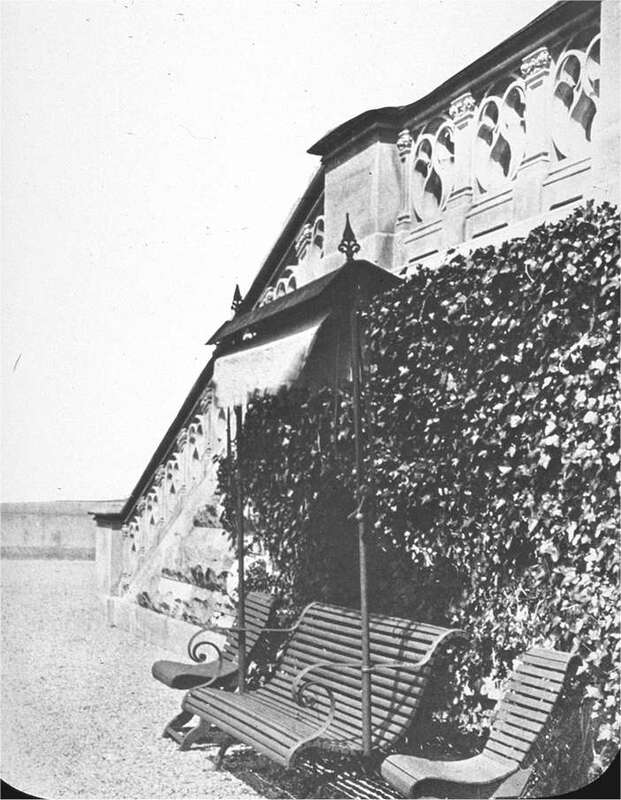 A shaded bench on the bowling green circa 1895. 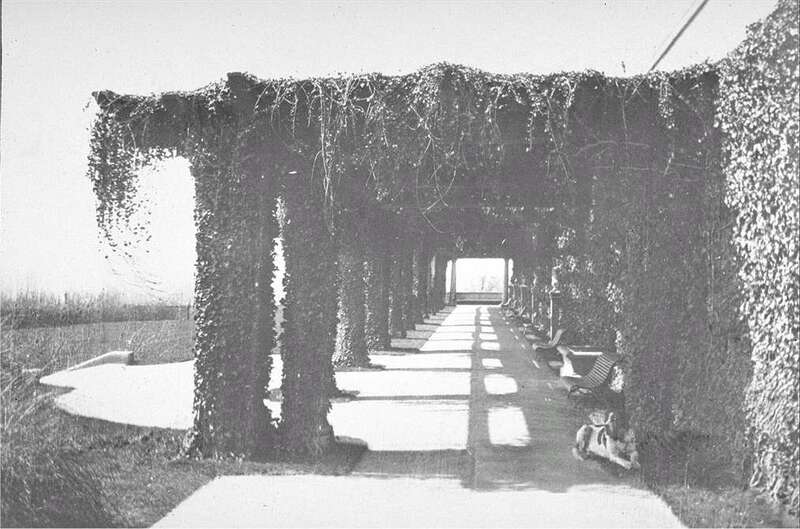 The tea house showing the sun shades which are gone today. The collecting tank for the estates water supply. This huge tank is above the house thus water after passing through several sand filters entered the home with enough pressure to reach the 4th floor. Today the estate is on Asheville city water, however the original system does work and could be turned on again if needed. The northern side of the esplanade circa 1900. 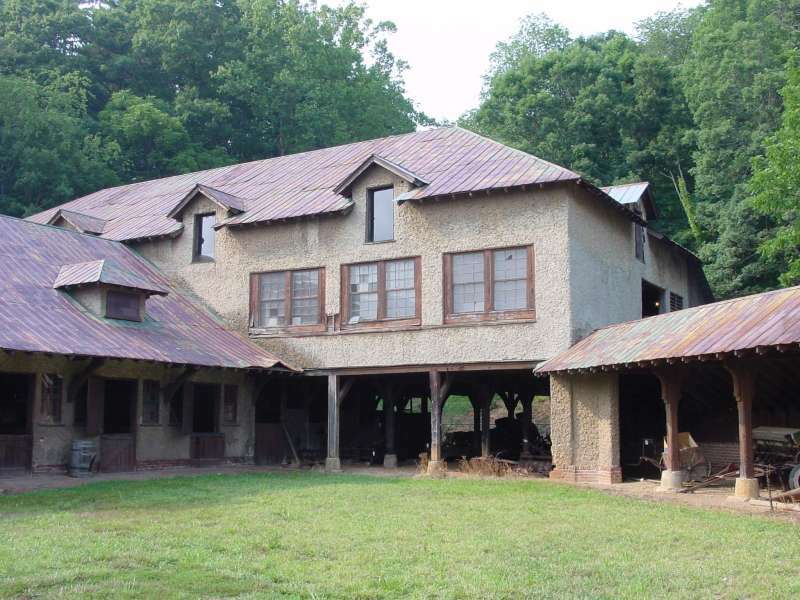 Buckspring lodge, George's hunting lodge on Pisgah mountain. This rustic lodge built in 1900 was demolished in 1960. 647 5th avenue New York. 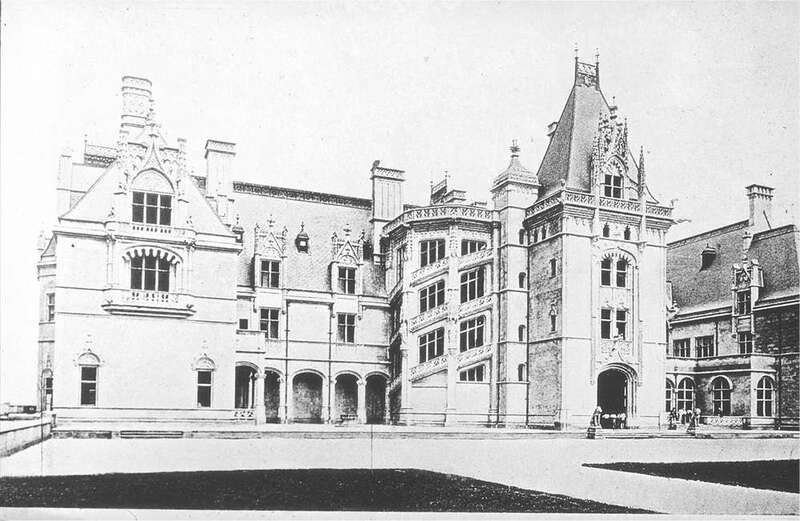 This home one of two was built by George Vanderbilt across the street from his block long mansion. Called the marble twins Cartia is the owner of the remaining building now. Each Christmas they wrap the entire structure with a giant Christmas bow. Brick farm completed in 1898, was the center of the estate farming operations. Part of the Brick farm as it is today. Currently this facility is slated for restoration. All Souls Episcopal church. This amazing cathedral is seat for the Western North Carolina diocese. This church was completed in 1896. 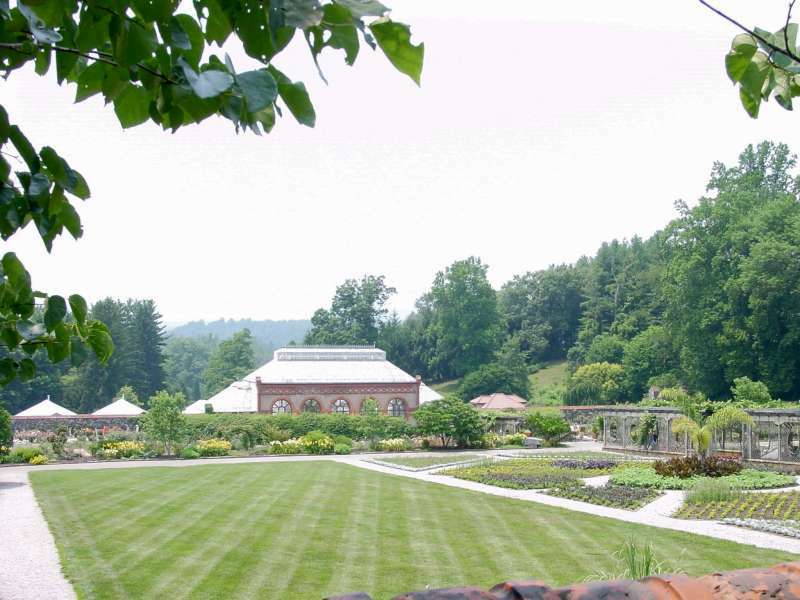 The walled garden as it appears today. The bachelors quarters over the stables. It was here that George spent his first nights in the home since the paneling in his master bedroom was not completed until 1896. Looking over the kitchen courtyard you can see 2 additions to the home. 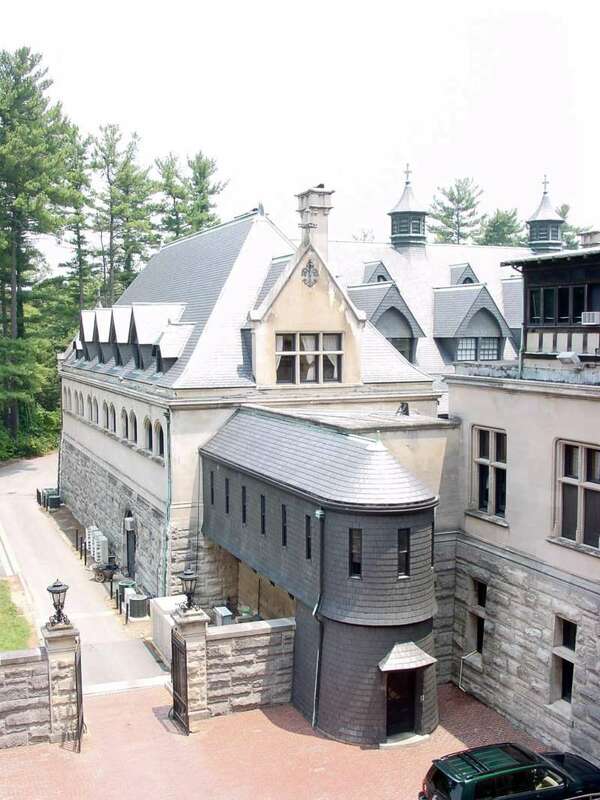 The slate covered stair case and hallway were added using leftover roofing slate in 1897. The wooden addition 2 floors up to the right is a sun room added in the 1920s (The window unit air conditioner might help you find the room). This sun room is currently slated for removal in keeping with the concept of maintaining the home in its 1895 configuration. 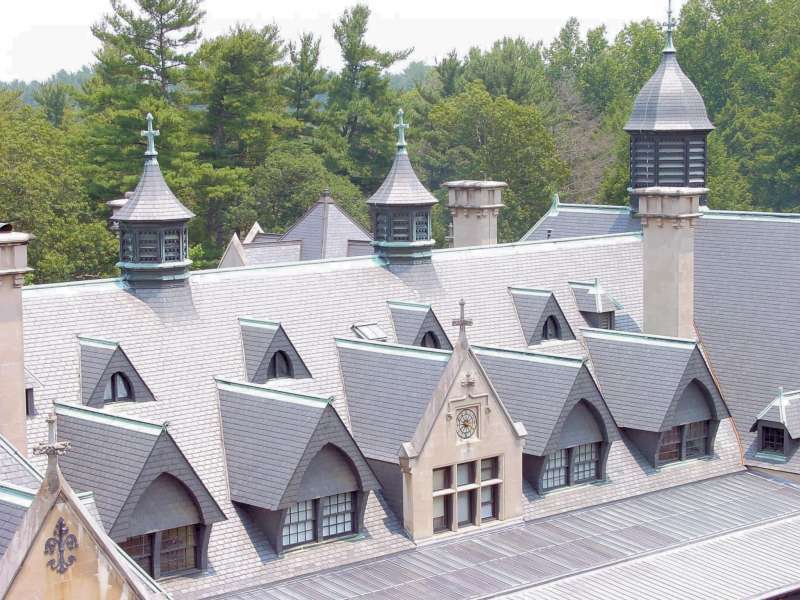 The hand hammered French copper roof ridge. You can see the alternating acorns and intertwined "G V". Acorns were part of the Vanderbilt family heraldic device. All the raised lettering and acorn work was original gold leafed. You can still see traces of this gold work on the roof top tour today. 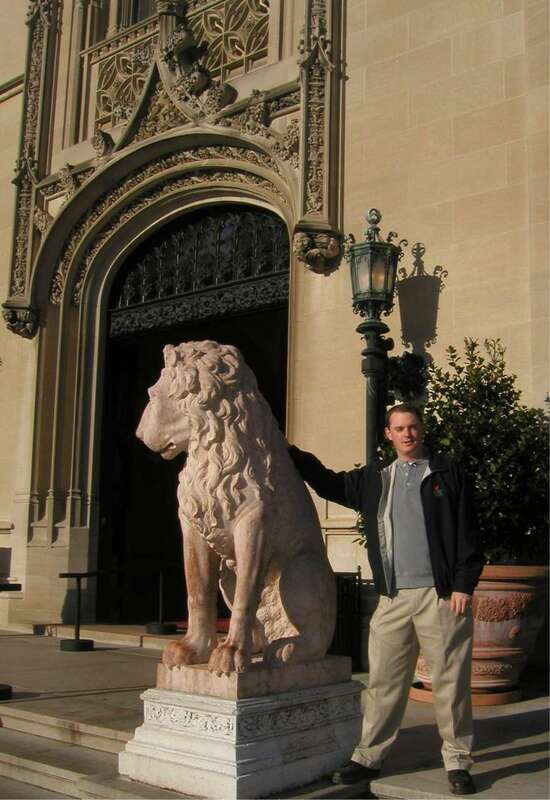 Your author standing by one of two 13th century life size Italian marble lions that guard the entrance to the home. 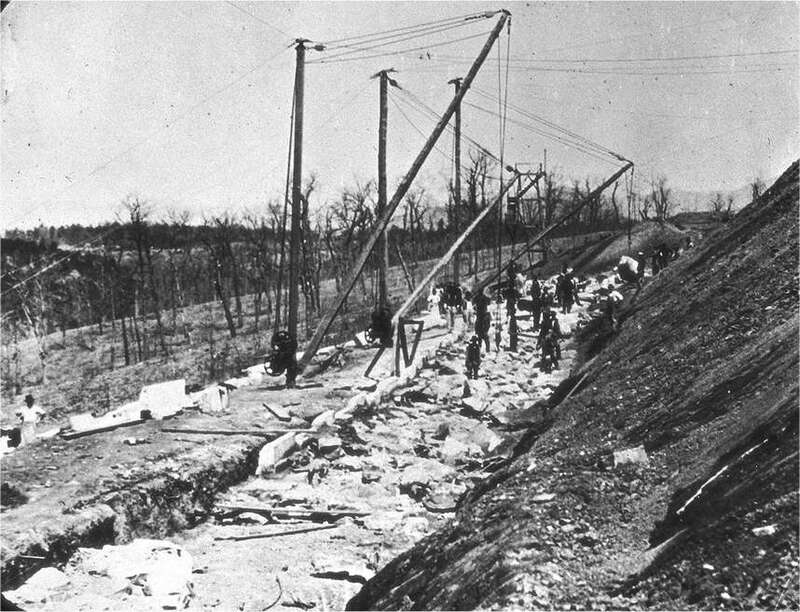 Some photos on this page are to be credited to the Library of Congress, Prints and Photographs Division and have been published by permission. All other images are the authors collection.